To be honest I am not really a morning person, but once I am up and have had a coffee, it doesn't take me long to get ready. There are many dancers that I would love to dance with, however I would love to find a partnership of my own like Sir Anthony Dowell and Dame Antoinette Sibley or Tamara Rojo and Carlos Acosta because there is something really special when you watch two dancers together who have a great connection on stage. Before I joined the company I did very little to my pointe shoes, but since then I have learnt many different ways to prepare my shoes with darning, cutting, shaving and shellacing. At the moment I am on holiday, so my routine isn't much of a routine. I try to get up not too late, may be around 10 and every day is a little different. I work out to stay in shape and spend time with my family as there is little time during the season to see them - and rest up for the coming season. Alan Carr, Beyonce Knowles, Simon Cowell, Cheryl Cole, Johnny Depp and Gordon Ramsay. That I am quite stubborn. 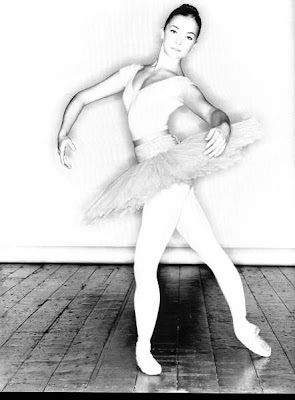 Having started JA's (Junior Associates) of the Royal Ballet in Bristol at the age of 8 Karen Paisey was a big inspiration in my decision to audition for a place at White Lodge. At White Lodge the first dancer I was introduced to was Darcey Bussell and her story of her determination to succeed became a huge inspiration to me. Whilst at White Lodge I was very fortunate to have watched many other dancers that have also inspired me in so many different ways. Hard working and reliable, but always up for a good giggle. Always give the best you can give and never give up on your dream. Since joining the company dancing in the corps de ballet has not been a walk in the park. Learning to dance in a line with 24 girls is something that takes a lot of time and dedication, however I am really looking forward to some more challenging roles. I had some of the funniest times in my life living with my three closest friends in our first flat in central London, but you had to be there to find them funny. I always loved tutu's and was always asking my mum to buy me one, so I would design a tutu that not only looks stunning on stage, but is comfortable to dance in too. Getting my photo taken by David Bailey. I really enjoy going to the cinema and I wouldn't pass up the opportunity to be in a film, so if given the chance I would probably like to play myself. I used to be quite good at long distance running before ballet become my focus. Nice to "meet" you, Elise, and your fascinating blog. I love dancing, so I never miss any show by a good company. The interview is very interesting, I laughed with her choices of dinner guests, what a group! I've loved each of your interviews Elise - you are a true journalist and really know your subject. It makes such a change to read well-informed articles about the ballet - I think you are one in a million ! Really laughed with this one - i love your interviews they are so entertaining - in a good way of course ! Thank you everyone for your lovely comments. I'm delighted you are enjoying the interviews and my website. what a beautiful person/dancer she is ! I'm such a sucker for anyone who dances....and was glued to my television once again for this most recent season of "so you think you can dance"
Delightful interview and lovely pictures. Great blog. I love the interview set-up. I look forward to see what comes in the future. Thanks Elise, for the nice comments over at my site. I can tell you have a wonderful and dedicated blog here too. that would be one interesting dinner party! Ballet is something I know nothing about, though I am enchanted by its beauty. You have a very interesting blog here. Thanks for visiting mine! thanks for dropping by my blog! See you around.. I am a big fan of ballet and ballerinas! The fact that you're a journalist and a ballerina is just awesome! BabYpose - in terms of starting ballet ? No not really - it's a natural progression when you're young - you hear the music and want to dance or you just dance ! Some schools take children from 3yrs. His Sweetheart - welcome and thank you for your lovely comments ! What a fascinating subject to know about and be able to write about so well. I've always wanted to know more about classical ballet; all types of dance, really. An artform I know little about. Thanks for visiting my blog. I am on my way out for vacation, but I will stop in again soon. So nice to meet you and thank you for stopping by and your kind comment on my blog. I so enjoyed your interview and past posts too. You are a wonderful writer with great pics. I hope to see you again soon as I have become a follower. Hello, Elise :) You have a lovely blog. I have always loved the ballet...alas, I am not a ballerina. So neat to visit you and learn more about such beautiful things. Thank you for your lovely comments on my blog last week. I am looking forward to reading more of your interesting site! What a lovely blog! Really enjoyed this interview and the others I've read. I really look forward to reading and learning more! This is a wonderful interview! I thoroughly enjoyed reading it and even learned a few new things about ballet. I took ballet for seven years to supplement my figure skating :) My posture thanks ballet very much. Wonderful blog! The world of ballet has always fascinated me. Edward Villella choreographed 5 songs I composed in odd time signatures. They were performed with a live rock band on stage. Your interviews are fun to read! Thank you for this wonderful interview, and for your kind comment on my blog. 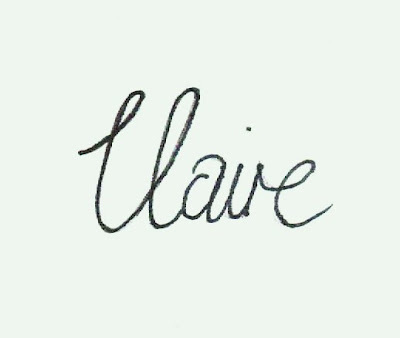 Claire is so graceful.. I enoyed reading this interview and the others too. Am adding myself to your list of followers. I love yours as well. Great interview! thank you for the kind comment you left on my blog! You have a lovely blog with beautiful pictures! I'm glad you left a comment on my blog or I would have never found it. Keep up the good work! Hi there Elise, nice to 'meet' you and thanks for your lovely comment on my blog. I've showed my budding ballerina some of the photos on your site here and she was awestruck! I can see we will become regular visitors. Thank you for that compliment. I really enjoy reading your blog as well. It's very neat, easy to read, and yet you are very articulate (must be the journalist in you). I always wanted to do ballet dancing when I was a young girl, but instead my parents directed me towards playing the clarinet and joining marching band (not my idea of fun). Thank you for the wonderful interview!! I’m giving away capelet patterns to anybody who left a comment on the Capelets Take Flight blog post. If you'd like to receive them, can you let me know your email address. (mine is hfmedia@bigpond.net.au) Hope all is going well. She is a beautiful girl, so full of grace. And well done to you for the interview, i enjoyed reading it.